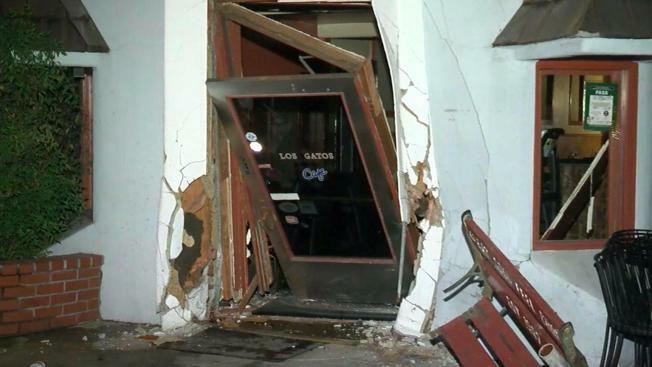 A car slammed into the Los Gatos Cafe's downtown location Sunday, busting the building's front door and forcing the popular establishment to close. The collision occurred just after 2 a.m. in the front of the business, which is located at 340 N. Santa Cruz Avenue in the South Bay City. Footage of the aftermath captured the restaurant's front door caved in, damage to the building's front facade and police conducting an investigation, which included examining a red SUV involved in the crash that suffered damage near its front right wheel. Despite the damage, the owners of the cafe appear to have a sense of humor. A sign posted on the boarded-up front door read "Somebody mistook us for a 24-hour drive-thru restaurant." A car slammed into the Los Gatos Cafe's downtown location Sunday, busting the front door and damaging the building's front facade. Los Gatos Cafe, which is a popular brunch spot, was forced to close following the crash, much to the chagrin of weekend regulars. "Many people are disappointed when they come up and read the sign saying that they're closed," Richard Hanke, the co-owner of a business next door to Los Gatos Cafe, said. "Hopefully they will reopen shortly once they repair the damage." The eatery is known for serving breakfast and lunch on a daily basis, and eager eaters sometimes wait more than one hour on weekends to grab a table. Hanke noted that the time of the crash likely saved lives. "Everyone is really surprised and I guess all thankful that it didn't happen when normally there's 50 people standing out here," he said. The driver was taken to the hospital, but it is not clear what were injuries were. It is not clear at this time what caused the crash.